MMs Coupon | A Savings WOW! 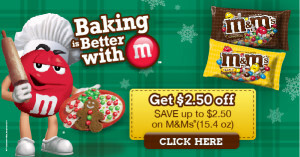 * HOT * $2.50 Off M&Ms Coupon – Great for Baking! We’re always looking for different ideas for baking with chocolate and there are so many creative ways to use M&Ms that make it so fun! How do you use M&Ms to jazz up your holidays? Do you prefer Peanut M&M’s or Plain M&M’s? We’d love it if you share how you get creative with your M&Ms! Want to impress your friends with your baking skills? Bake a dessert that will be the highlight of every meal with M&M’s® chocolate candies! Print out your coupon, buy some M&M’s® at Walmart, and pre-heat the oven, because whether you have an office or class party, or just want to treat your family, it’s time to get out the oven mitts and start baking!